Our EDDM client of the week is DuVault Premium Auto Storage and Detailing Services! 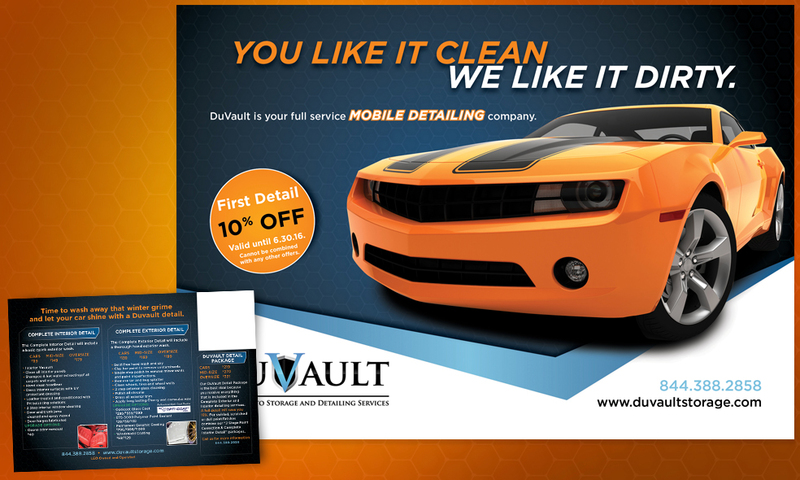 DuVault contacted ummhumm | creative studio for an Every Door Direct Mail® (EDDM) postcard to promote their automobile detailing facility. After their success with the mailer, DuVault asked for a tri-fold brochure for events. Carrying over design elements ensured DuVault had consistency as they took their services to market. We love all things auto here and these projects were as fun as DuVault was receptive to our design vision. If you find yourself near Palantine, IL, and need mobile detailing or storage for your ride, check out DuVault. 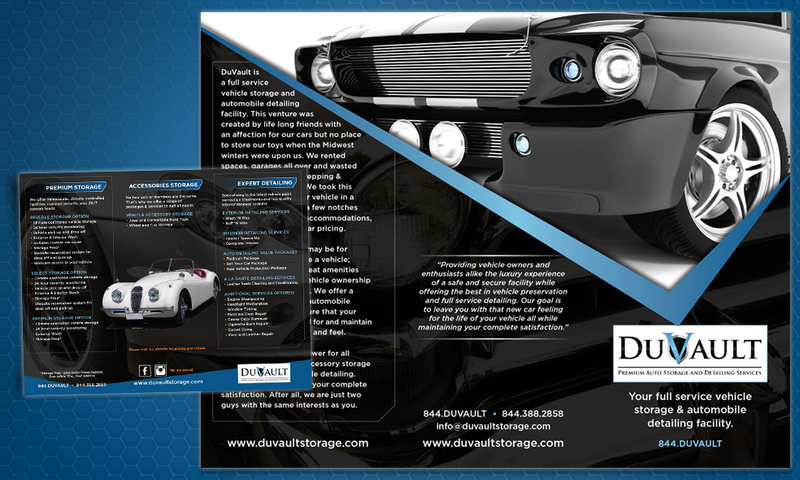 DuVault is a full service vehicle storage and automobile detailing facility. This venture was created by life long friends with an affection for our cars who had no place to store personal toys when the Midwest winters were upon us. We rented parking spaces and garages all over while wasting countless weekends prepping and checking on our vehicles. We took the concept of storing your vehicle in a self service facility up a few notches by adding 5 star hotel style accommodations, while maintaining similar pricing. Whatever your reason may be for needing a place to store a vehicle; DuVault offers great amenities to maintain that your vehicle ownership experience is satisfying. We offer a complete professional automobile detailing facility to ensure that your vehicles are always cared for and maintain that new car look, smell and feel. Let DuVault be your answer for all vehicle storage, auto accessory storage and complete automobile detailing. Our number one goal is your complete satisfaction. After all, we are just two guys with the same interests as you. Business owners, Pat and Mat have been detailing their own personal vehicles and their friends’ cars for many years. But in 2015, they decided to take their education up a notch by attending and graduating the 3-day Craftsman Class at Detail King in Pittsburgh Pennsylvania, the top detailing training facility in the country. There, they received in depth hands-on instruction in completely reconditioning pre-owned vehicles. This included completely detailing the interior and exterior of vehicles while also learning about paint correction. Additionally, Mat and Pat learned and will offer such services as headlight restoration, plastic trim restoration, carpet and mat dying and odor elimination.